The course “Introduction to Azerbaijani Culture” was created in KMT in 2000 and further developed since that time based on practical recommendations, comments and the feedback of participants from different countries. The KMT Azerbaijan Culture course has now become the premier training course in Baku, that helps expatriates of different cultures to focus on the cultural roots of our country and the behaviour of its people, both in society and business. The understanding of cultural diversities obtained from the course content minimises “culture shock” and enables newly arrived employees and their family members to interact with people in Azerbaijan. 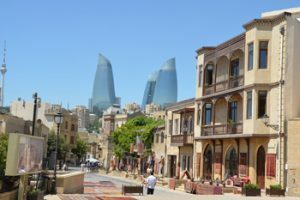 This course is designed as a set of lectures and a slide show on Baku and Azerbaijan related topics, given in English. It is illustrated with colourful maps, photos and videos. Each lecture enables the foreigner to become much more aware of the local style of life behaviour, culture, customs and traditions. The course can be extended by a city tour relevant to the topic or a cooking class of traditional dishes. Azerbaijan has always been a country of East and West. 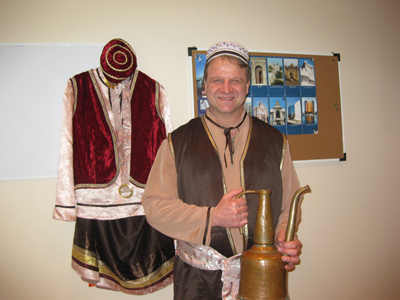 Ancient culture and modern lifestyle, Islamic traditions and secular customs make Azerbaijan a piece of Europe in Asia or a piece of Asia in Europe. Azerbaijani architecture is a fusion of East and West, of Europe and Asia. Here you can find gorgeous eastern mosques surrounded by western buildings in baroque style and modern tall buildings covered with coloured glass blocks. It could be divided into four periods: medieval, oil -boom, Soviet and modern architecture. Medieval architecture is represented by buildings in Asian style. 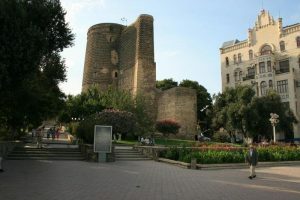 The brightest example of Medieval architecture is Icheri Sheher (Inner city) in Baku. This is the inner part of the city that refers to the XII century. The main parts of Icheri Sheher: Maiden Tower, Shirvanshahlar Palace, famous bath house, Lezghin mosque and the wall surrounding the inner city which is also called the old town. You can also find many mosques around Azerbaijan built in eastern style during the medieval times. 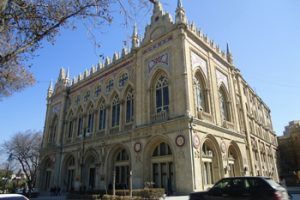 Oil boom period architecture is mainly represented in Baku. Buildings of this period refer to the period between 1880 and 1920. This was the time when first oil was found in Azerbaijan and many people became millionaires because of the developing oil business. The oil millionaires often spent their money on building new residences, palaces, theatres and halls. As illustrations of the oil boom architecture Taghiev’s residence, Ashurbeyov’s residence, Mukhtarov’s wedding palace, the Opera and Ballet Theatre built by Mailov would be suitable examples. The oil boom architecture had its own original features, similar to the architecture of the Italian Renaissance and Baroque styles. For example Phillarmonic hall, built in 1912 and City Hall building, constructed in 1904, where elements of European architecture were widely used. Soviet period architecture refers to the years between 1920 and 1991 and could be described as mix of different European architecture styles, including classical style, baroque and rococo. Many buildings of Soviet period were constructed by Mikayil Useynov. 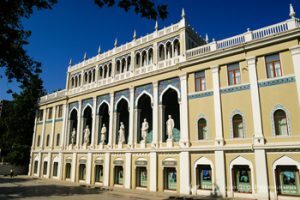 The most significant examples of his works are Academy of Science Building, Nizami Cinema, Akhundov National Library, Music Academy, The Nizami Literature Museum and Cabinet of Ministers. Azerbaijan modern architecture is well presented in Baku. Since 1991 the country has invested heavily in modernising and developing the capital’s architecture. Among modern architectural masterpieces of Baku are Heydar Aliyev Center created by worldknown architect Zaha Hadid and Flame Towers. Azerbaijani people like warm and friendly greetings. Women hug and kiss each other once on the left cheek. Azerbaijani women do not generally shake hands among themselves, although many will shake hands with a foreigner. Men should wait and see if a woman extends her hand – if they do shake it lightly. If you do not know the person well, use their first name followed by an appropriate title. For women, use “khanum” (ms/mrs). For men, use “bey” (mr) or “muallim” (teacher) for elderly men . People in Azerbaijan mainly exchange gifts for birthdays, weddings and anniversaries. It is the thought behind the gift, rather than the price, that matters. 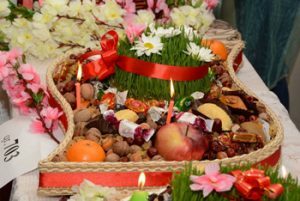 It is considered polite to reciprocate hospitality with a small gift, if you are invited to an Azeribaijani’s home. Table manners are fairly formal. – A cat crossing your path means bad luck in business. – Salt accidentally spilled means you are about to quarrel. Sprinkle sugar on the salt to counter this. – Leaving scissors with opened blades brings misfortune and even death. – If you meet a person with empty buckets, you are bound for misfortune. – If you meet a person with bread and full bags, you will have good luck. – Never hurry to a funeral ceremony. – Do not cross the way the funeral train goes. – If the first person you meet on your way to work is male, you will have good luck. – Do not lend money or bread at night. – Throwing a bowl of water in the wake of a person who sets off for a business trip or long journey brings the person luck and helps them to return home safe and sound. Azeris have a high level of education and love and know their literature, especially their poetry. Azeri poetry is represented by such luminaries as Nizami Ganjavi, the peak of whose creative activity “Khamsa” is included in the treasure-house of world literature, Afzalladin Khagani, Samad Vurgun, Mehseti Ganjavi, Bakhtiyar Vahabzadeh, Mohammed Fizuli, Molla Panah Vagif, Khur-shud-banu Natavan and others. The most famous among them are Nizmi, Fizuli and Nasimi. 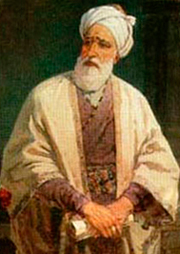 Nizami Ganjavi was born around 1141 in Ganja, where he remained until his death in about 1209. He lived in an age of both political instability and intense intellectual activity, which his poems reflect. Although he left a small corpus of lyric poetry, Niz?m? is best known for his five long narrative poems: Tresury of Secrets, Seven Beauties, Leyli and Mejnun, Iskandarname, Khosrau and Shirin. You can find manuscripts of Iskandarname in the British Library in London. Fuzuli is one of the greatest Azeri-Turkish poets. It is generally considered that he was born app. in 1498 in Kerbela (in the area presently known as Iraq). He wrote: “…I am master of all the arts in discussing beauty of expression and in disputing agreeableness of style with those who are masters of one art only. Well, all this demonstrates the total “presumption” (“fuzuli” in Arabic), but also the perfection of Fizuli”. Fuzuli had left us writings in Azeri (Turkish), Persian and Arabic. His wrote great number of poems but “Leyli and Mejnun” is the most famous among them. This poem is about to lovers, who could not be together because of different circumstances and died far from each other from their unhappiness and sufferings. and the Antecedents to the Pain and Affliction that follow. With angel-like beauties he passed all his time. The first one of girls, the second of boys. For languishing maids can enchant with their eyes. Surround him and tease him and quicken his manhood? Were patience his portion, what word could he say? In Nasimi’s time, Azerbaijan had recently freed itself from the Mongol yoke, but was subsequently invaded by the conqueror Tamerlane. In the midst of this political and cultural turmoil, the Hurufi sect emerged, asserting that the individual and God are fundamentally One. 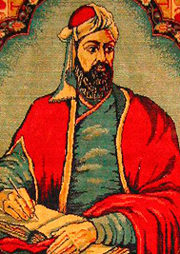 Nasimi joined the Hurufis, assuming the name Nasimi in imitation of his teacher, who was named Naimi. Because of their non-dualistic beliefs, the Hurifis were often persecuted. 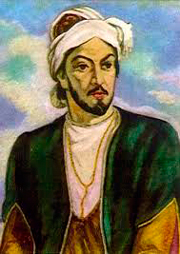 After the death of his teacher at the hands of Tamerlane’s son, Nasimi journeyed across much of the Middle East to spread the teachings of Hurufism and to write sacred poetry. In 1417, he was arrested by the orthodox religious authorities in Aleppo, Syria, where he was executed for his “blasphemous” poetry. Both worlds within my compass come, but this world cannot compass me. An omnipresent pearl I am and both worlds cannot compass me. Be silent! For there is no commentary can encompass me. Through doubt and surmise no one came to be a friend of God and Truth. The man who honours God knows doubt and surmise cannot compass me. Body and soul I am, but soul and body cannot compass me. I am both shell and pearl, the Doomsday scales, the bridge to Paradise. With such a wealth of wares, this worldly counter cannot compass me. I am “the hidden treasure” that is God. I am open eyes. I am the jewel of the mine. No sea or mine can compass me. Although I am the boundless sea, my name is Adam, I am man. I am Mount Sinai and both worlds. This dwelling cannot compass me. I am both soul and word as well. I am both world and epoch, too. Mark this particular: this world and epoch cannot compass me. I am the stars, the sky the angel, revelation come from God. So hold your tongue and silent be! There is no tongue can compass me. I am the atom, sun, four elements, five saints, dimensions six. Go seek my attributes! But explanations cannot compass me. I am the core and attribute, the flower, sugar and sweetmeat. I am Assignment Night, the Eve. No tight-shut lips can compass me. I am the burning bush. I am the rock that rose into the sky. Observe this tongue of flame. There is no tongue of flame can compass me. Azerbaijan cuisine is traditionally considered to be an exotic element of the national culture for foreigners. And it is indeed as it has everything to be exotic. It is original, poignant and reflects the richness of the country by itself. It constitutes the abundance of meat, fish and vegetables dishes seasoned by sweet scented greens and spices. 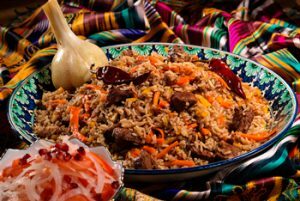 Any experienced gourmand visiting the republic would be amazed by fine taste and delicate flavor of the Azerbaijan cuisine. Dishes are unique and original, and can not be confused with dishes of other national cuisines. 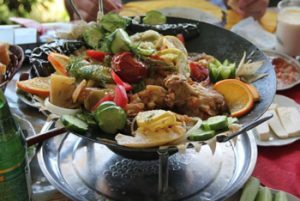 The Azerbaijan cookery has preserved old cooking methods although has modified them taking into account up-to-date techniques. In cafes and restaurants some national dishes are served in special crockery in which the dish is prepared. Below are some traditional recipes that constitute the core of the national cuisine. 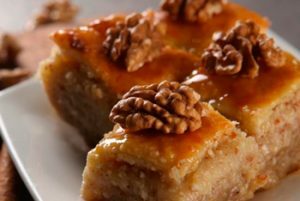 To make the filling, grate shelled roasted walnuts and mix with sugar in a ratio of 1:1. Warm the milk, add yeasts, salt, egg, butter and sieved flour and make dough. Leave the dough to stand for 1-1.5 hours. Roll the dough 0.5 mm thick. Put a sheet of dough on a greased tray, spread a 3-4 mm layer of filling over it and cover with another sheet of dough, grease the dough and spread a layer of filling. Continue in this way until you have 8-10 layers. Cut pahlava into diamond-shaped pieces of 1O x 4 cm and brush with egg yellow mixed with saffron. Place half of a nut kernel or pistachio in the middle of each piece and bake for 35-40 minutes at a temperature of 180-200 ‘C. Glaze pahlava with syrup or honey 15 minutes before it is ready. Dovga is soup made of yogurt. Mix flour and egg and add some rice. Boil the mixture continuously stirring to prevent it from curdling. When the mixture begins to boil, add finely chopped greens and salt and boil until cooked. Dovga can be prepared with or without meat. In the first case, peas are boiled until half cooked, then small meat balls are made from minced meat and boiled with peas until ready. The cooked peas and meat balls are then added to the basic mass. 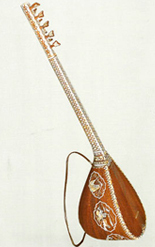 Music in Azerbaijan has been developing since 3-5 millenniums B.C. At that time people of the Stone Age used to play musical instrument called “gaval-dash” (stone-tambourine) in place Gobustan (not far from Baku). 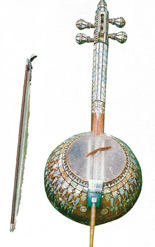 From those times a lot of different national musical instruments have been played. 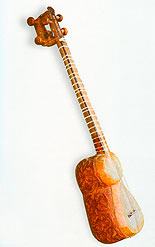 The most popular national musical instruments nowadays are tar (a stringed musical instrument played by plucking), kemancha (a string musical instrument played with a bow), balaban (a woodwind instrument), def (a percussion instrument), saz (a string instrument played by plucking with a plectrum) and other types. In music an ancient tradition was carried into modern times by ashugs, poet-singers who presented ancient songs or verses or improvised new ones, accompanied by a stringed instrument called the kobuz. Another early musical form was the mugam, a composition of alternating vocal and instrumental segments most strongly associated with the ancient town of Shusha in Nagorno-Karabakh. At the close of the eighteenth and at the beginning of the nineteenth centuries, famous Shusha singers Shakhsanam oglu Yusif, Mirza Husryn Gasanja, Mirza Ismail widely popularized classic mugams and laid the foundation of the Khanende – singer’s art, when the singer performs mugams with perfect mastery. There are 7 classical forms of mugam. These are: Rast, Shur, Seygah, Chaargah, Bayati – Shiraz, Shushter, Humayun. At the same time, each of these mugams has a fixed number of parts. And only singers, who could perform all parts of all of the mugams correctly, deserved the name Khanende. An independent area of the Azerbaijan musical folklore is a dancing music distinguished by its diversity and relief of rhythmic figures. Azerbaijan music could be also divided into two categories: Asian influence music and European influence music. Mugham, ashugs music and folk dancing music are formed under Asian influence. Another baranch of Azeri music that includes Azeri opera and ballet is formed under European influence. Azeri opera and ballet started to develop in the XIX century. The great Azeri composer Uzeir Hajibeyov was the founder of first Azeri ballet and opera. Famous Azeri opera Leyli and Majnun, written by Uzeir Hajibeyov in 1907 was the first opera written not only in Azerbaijan but also in the East. 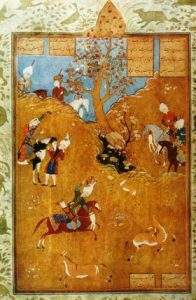 Leyli and Majnun is a tragic love story set in the XII century and written by great Azeri poet Nizami. The following works of Uzeir Hajibeyov such as Husband and Wife opera (1909), O Olmasin, Bu Olsun (If Not That One, This One) music comedy (1911), Shah Abbas and Khurshid Banu opera (1912), Arshin Mal Alan (The Cloth Peddlar) music comedy (1913) and Keroglu (Son of a Blind Man) opera (1937). All his works have a great success and are often performed in the Opera and Ballet Theatre. Another great Azeri composer is Gara Garayev (1918-1982). He wrote more than 110 pieces, including ballets, operas, symphonic and chamber pieces, piano solos, cantatas, songs and marches. The most famous among them are opera “Vatan” (Motherland) (1945), ballet Seven Beauties (1952), ballet Thundered Path (1957), opera Nargiz (1957). Fikret Amirov (1922-1984) was another famous Azeri composer, who left a profound imprint on Azerbaijan’s music. Amirov composed symphonic music, vocal chamber music and piano music mainly. In his works he uses a lyric tone as basis and transposes elements of the tradition of Azerbaijan in his music. The most famous Amirov’s works are “Robbers of the Heart”, musical comedy (1944), “Happy News”, musical comedy (1946), “The Seagull”, opera (1948), “Shur”, symphonic mugam for orchestra (1948), “Syevil”, opera (1953), Arabian Nights (1001 nights), ballet, (1979). Western influence on Azerbaijan music reflects not only in development of opera and ballet but also in the development of jazz music. The most famous Azeri jazzman is Vagif Mustafazade (1940-1979). He was the first jazzman in the world that created the style of “jazz-mugam”, a blend of jazz and Azeri folk music. His works had a great success not only in Azerbaijan but also around the world. Vagif Mustafa Zadeh won first prize at the 8th International Music Festival in Monaco in 1978. He composed a great number of jazz works mixing different syles of jazz with various elements of Azeri folk music. There are a lot of different talented artist in Azerbaijan but the most famous among them are Tahir Salahov, Sattar Bahlulzade and Togrul Narimanbeyov. 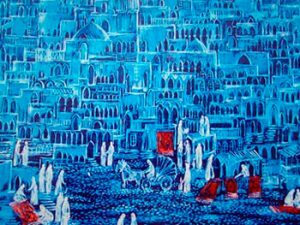 Tahir Salahov (1928) is famous Azeri painter, whose work as are very well known in Azerbaijan. He has his own style distinguished from other painters. 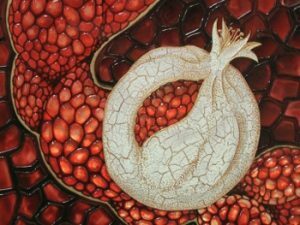 In his works red is a color that is vividly used. It is great for accenting specific objects-whether it is naturally red objects such as chili peppers, pomegranates or books, or objects not normally associated with red such as an oil tanker, an oil pipeline, a man’s shirt, a windmill or even the Eiffel Tower in Paris. In Tahir’s early work, apart from this touch of red, the remainder of his canvas was typically spread with neutral tones ranging from light gray and beige to darker shades of olive, brown and black. Take away the red, which obviously was associated with Communism, and the painting loses its dramatic edge. Among his works are paintings “New Sea”, “Morning Train”, “Reservoir Park”, “The Maintenance Men”, “Oil Worker”, “The Shift is Over”, “Women of Absheron”, “Still Life with pomegranates” and others. Sattar Bahlulzade(1909-1974) is another famous Azeri artist. He is known for developing his own unique style of painting landscapes. His style was surreal and cosmic; some of his paintings are reminiscent of photos of the earth taken from space. Using a combination of pastel colors and bold strokes, he made nature look more colorful and lively, and sometimes even more fantastic, than it did in reality. Bahlulzade’s famous works are”Babak’s Revolt”, “The Tears of Kapaz”, “The Shamakhi Vineyards”, “The Wish of the Land”, “Bazarduzu Outskirts”, “Old Shamakhi”, “Autumn in Nakhchivan” and others. 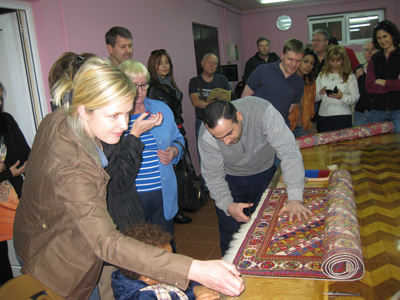 Carpet-making is one of the ancient fields of the decorative-applied art of Azerbaijan. According to archeological excavations in the territory of Azerbaijan and to literature sources, carpet-making had been conceived in ancient times. Carpet and carpe-ware made in Azerbaijan had repeatedly been glorified in historical books, classic and folk literature. Magically playing, the colors of carpets absorbed ruby brightness of pomegranate, golden brilliance of quince, copper of saffron and lilac tints of grapes. Inexhaustible richness of colors, unique beauty interlacement of patterns, flight of artistic fantasy and consummate skill – that is Azerbaijan carpet. According to the historical sources, Azerbaijan was one of the most important centers of pile and flat-woven carpets production in the East in Middle Ages. Facts confirm that north-eastern part of Azerbaijan was a center of high quality carpets production in the VI-VII centuries. Descriptions of the carpets are met in Azerbaijan classical literature as well especially in the masterpieces of great Azerbaijan poets as Gatran Tabrizi ( XI century), Nizami Ganjevi, Khagani Shirvani ( XII century) and others. In the XIII century Venicean traveller Marko Polo wrote: ” there are many skillful masters, producing textile, carpet and sabres widespread all over the world in Azerbaijan”. 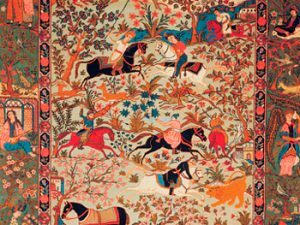 In the second has of the XV centuries Azerbaijan carpet-making began to use golden and silver threads, precious stones in silk carpets. In the XIII-XIV centuries Azerbaijan jewelry and carpets attracted European, especially Venice merchants. And it’s not casually, that we can find Azerbaijan carpets on the canvases of the famous European artist. We can observe them on the picture ” Ambassadors” of Gans Golbein ; well-known Netherlandian artist Yan Van Eik painted his picture “Madonne of the Canon Van der Pale” with the Azerbaijan carpet “Kuba” on its background. According to the technology and artistic decision Azerbaijan carpets can be divided into two types ” flat-woven and pile carpets. There are 7 methods of technique of flat-woven carpet-weaving, which resemble tapestry, at the same time there are only two methods of pile carpet-weaving. Each Azerbaijan district is famous for its own original carpets and carpe-ware peculiar for the given zone. Palas, Jejim, Shedde, Kilim, Zili, Varni and others are considered to be Azerbaijan flat-woven carpets. Since ancient times carpe-making in Azerbaijan was women business, who cautiously shared their experience from generation to generation. Composition, ornamentation and artistic methods were closed and clear to every carpet-maker, no matter how complicated they were.